Recently I was asked if I get help set up Hyper V Core 2012 on a so you start dedicated server. Firstly – So You Start (www.soyoustart.co.uk) are part of OVH. Their dedicated servers are really cheap. Their network is fast, the dedicated server performs well. However as you might expect for the money, their support is lacking to say the least. I spent a good two days trying to figure out how on earth to setup a public switch on a server with one NIC, which is also used to remotely administer the box. Every time you try using a GUI the NIC is disconnected and you lose all contact with the box. Even restarting wont help you. Below are my steps to get a fully working Hyper V server with unlimited traffic for about £30 a month. Bargain. Usual Disclaimer– No Warranties/ Guarantees, Don’t blame me if it doesn’t work, bursts into flames or steals your dog. This worked for me, once. Hyper V Core, while excellent and Free doesn’t have much of a UI (Think Dos / Powershell). We’re going to use chocolatey package installer to save us a lot of time. For the latest commands and to find out more head over to www.chocolatey.org. This installs the chocolatey package manager. (This didn’t work for me. Instead I launched Chrome and downloaded it from File Zilla). Google Chrome – A web browser (If you don’t know this you probably shouldn’t be following these steps  ). This will allow us to download other installers as needed. See the notes on File Zilla Server below for an example. Files will be downloaded to c:\users\root\downloads. File Zilla Server – A solid FTP server allowing us to send files (Like Iso images for windows to our server and download backups of our VM’s as needed). Now Create a firewall rule allowing connections to filezilla through the windows firewall. Happy days. You can now start uploading a windows ISO to your shiny server. While that’s going on, we’ll configure Hyper V.
• Enable Remote Management and start opening up more ports in your firewall. Neither of these appealed to me. Fortunately a company called 5 Nine provides a Hyper V Remote Management Tool for free (I.e. no money). Using Google Chrome, head over to 5Nine and download it (Registration required) from www.5nine.com. Unfortunately it comes as a zip file. I downloaded portable 7 zip (No Install) to Expand it. Fantastic – You now have a tool to manage your Hyper Server. Whatever you do at this point do not create an external switch. The One and only NIC your server has would be used for the switch and a new virtual NIC created using DHCP. You lose all connectivity with your dedicated server. The only way to get it back I found was to reimage it. Let’s not do this okay? This is the hard part that really had me banging my head of the wall. If you create an external switch you lose connectivity. This will list the name of your adapters. Figure out which one you want to use for your switch. In my case it was Ethernet 2. To do this. Update it with the correct name determined above. This lists the ethernet adatpers. $ethernet = Get-NetAdapter -Name "ethernet 2"
This actually creates three switches, one of each type. (external, internal and private). Done. You now have a working hyper V server. Now Launch 5 Nine Manager and start creating your VMs. 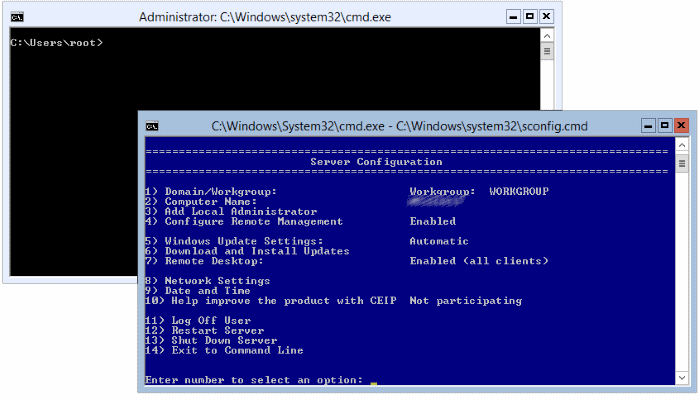 Read my next blog post on setting up a Hosting VM on a So You start Hyper V Server. Took a staggering 10 minutes to set up and 5 minutes of that was picking a theme.